Creatspace Independent Publishing Platform (2015)/ 202 pp. We are all familiar with documentaries of famous people: a narrative of a person’s life and a series of tightly edited interviews. 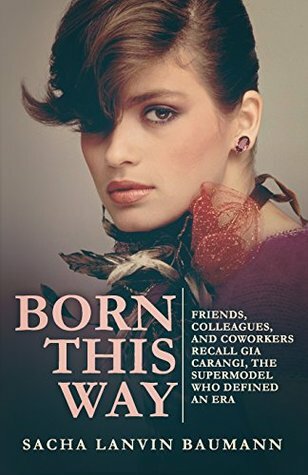 In many ways, Born This Way is a documentary of supermodel Gia Carangi in book form. It is a collection of interviews from a wide range of people which range from personal friends to casual work acquaintances. However, unlike most documentaries, there is a lightness of touch in the editing of the transcripts. Apart from learning more aspects of Carangi life, the voices of the various characters come through which makes the book come alive, even for those unfamiliar with the fashion world. There are a couple of occasions in which the interviewees confess that they only want to remember the good times, and not when her life spirals out of control with drug abuse. While this irks the sharp-minded biographer, such refusals are equally telling and contributes to the intrigue of Carangi. That said, this book could benefit from photographs to break up the barrage of interviews. This is especially so with the sections when the interviewees are saying more or less the same thing. The photographs, not only of Carangi but of the interviewees, also provide some much needed context especially to those unfamiliar with the fashion world. Otherwise, there is a risk of the interviews being a big blur after extended reading.